Queen Elizabeth along with the Duchess of Cambridge Kate Middleton visited the King’s College London to open Bush House, new education and learning facilities on the Strand Campus. Her majesty and Kate met a robot and visited a roof terrace overlooking London on their first joint engagement outside Buckingham Palace. The royals toured facilities and met the supporters of the development and also admired the city views which showed off a magnificent panoramic sight. Kate described the view as ‘impressive’. 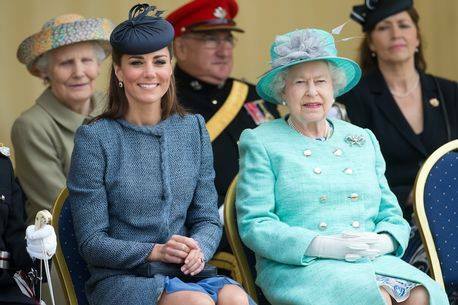 The Queen along with her grand daughter-in-law viewed robotics demonstration that included a robotic surgery and also a demo that showcased how sensors made from textiles can measure some useful information about the body. Kate looked elegant in a grey Catherine Walker coat for the engagement and was seen shaking hand with the robot and quipped, “Very nice to meet you”. The royals then also visited the King’s virtual trading floor and interacted with students from the Entrepreneurship Institute that supports entrepreneurial thinking skills and experiences amongst the students, staff and alumni. Kate also spent some time with Aysha Ingar, who has set up an app for Muslim Women and Tobi Oredien who found a media platform for black women in the UK. Ms. Ordein, after meeting the Duchess said, “She was saying that her parents are entrepreneurs so she’s all for it.” The Duchess of Cambridge also met Qasmin Munye, who has set up the app Shortly, for people who want to read short stories while on the go. 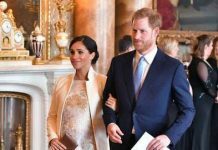 Munye expressed, “She mentioned that she thinks it would be good for her children before they go to sleep.” The app developer added that his conversation with the Duchess inspired him to add stories for the children to the app. The visit concluded in the development’s new auditorium where the Queen, who is the patron of the university, unveiled a plaque to formally open Bush House, before signing the visitor’s book with Kate.